Flexible Installation. German Engineering. Bosch Performance. Commitment to quality. That's the thinking behind Bosch's German-engineered 24" washer and dryer. The Bosch 24" laundry pair can be installed stacked, side-by-side, on pedestals, in a closet or under the counter, the perfect combination of function and style. Eastman's Steam-Dryer Installation Kit comes with all the components necessary to install your new steam dryer. Its quality is determined by what you can't see. The fill hose features a pvc core, multi-filament braided nylon reinforcement, a clear vinyl outer shell, and a grade 304 stainless steel braided exterior that is designed to prevent kinking and crimping. This flexible supply line resists corrosion and is easy to install. 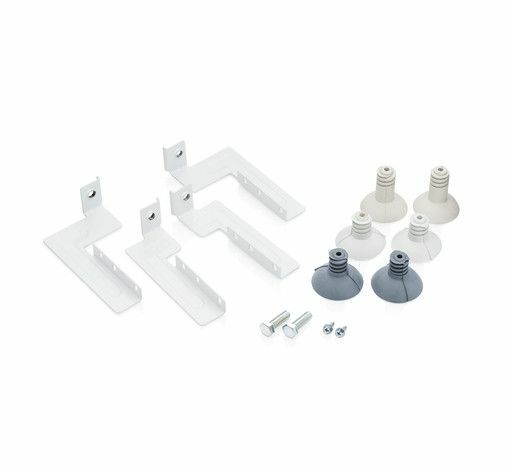 The EzConnect Dryer Duct to Wall Connector provides a secure and stable connection of the dryer to the wall. It simplifies dryer maintenance and overall safety by providing a simple, easy and quick access point to the dryer duct for cleaning of lint and debris on a regular basis. Raise your Front Load washer to a more ergonomic level with this laundry pedestal with drawer. Save on bending and stooping, and hide away laundry room supplies including laundry powder, fabric softener and stain sticks.